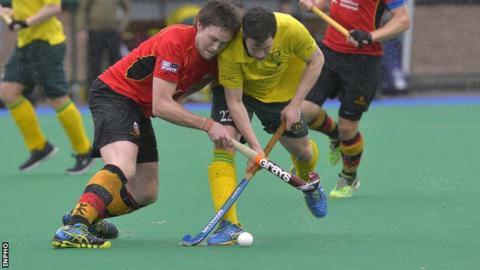 Lisnagarvey have moved seven points clear at the top of the EHL after defeating nearest rivals Monkstown 1-0. Banbridge came from two down at Havelock Park to beat Railway Union 4-2 and keep their play-off hopes alive. Annadale clinched a 3-2 away win over Three Rock Rovers, which was enough to move them off the foot of the table. In the women's IHL, Pegasus won 2-1 at Pembroke Wanderers but Ards were beaten 2-1 by Hermes and Ulster Elks lost 3-1 to Cork Harlequins. Lisnagarvey exacted revenge for an earlier 5-2 defeat by Monkstown in Hillsborough to win the rematch and establish themselves as favourites to lift the title and secure an automatic place in Europe next season. Mikey Watt, who joined the club from Surbiton before Christmas, got the all-important goal in the 40th minute. The Irish international pounced on a loose ball and drove the ball home from the edge of the circle. Garvey had a let-off shortly afterwards when a Monkstown penalty corner rebounded off the upright. The Dublin side withdrew their goalkeeper near the end of the final quarter in order to have an extra outfield player but the Ulster side held on for a crucial victory. Banbridge quickly found themselves 2-0 down against Railway Union as they converted their only two efforts on goal in the opening 15 minutes. But Mark Tumilty's side dominated most of the remainder of the game and Owen Magee converted his team's sixth penalty corner to reduce the deficit early in the second-half. Owen's brother Eugene equalised in the final period of the game and then Stevie Dowds converted from the penalty spot to make it 3-2. Eugene Magee added a fourth goal near the end as Bann avenged their Irish Senior Cup defeat by the Dublin side to stay in the play-off zone, eight points behind Garvey. Annadale also came from behind to overtake Cookstown, who play Pembroke on Sunday, and move into ninth place in the standings. They trailed 2-1 to Rovers but goals from Matthew Allister, Matthew Crookshanks and a late winner from James Cox clinched a first victory in nine starts. In the other game, Glenanne moved into fifth place in the table after a 6-1 away win over Cork C of I. In the women's league, a late winner from Alex Speers clinched victory for Pegasus over Pembroke Wanderers in Dublin. Rosie Henderson gave the defending champions the lead early in the second-half and then set up Speers for the winner after Caroline Hill had equalised. Pegasus have now opened up a three-point gap over their opponents as they stay in third place. A last-minute goal from Sally Campbell secured Hermes a narriow win over Ards - their 12th in a row - after Kerry Harvey had cancelled out Nikki Evans' opener. The Ulster Elks' play-off chances suffered another blow when they fell to defeat against Cork Harlequins, with Jessica McMaster netted the equaliser at Jordanstown. But the Munster side hit back with two late goals to move four points ahead of their opponents in the standings. In the other games, UCD won 5-1 at Greenfields and Railway Union beat UCC 2-1 in Dublin.